I was once a medical professional who would have said that ‘vaccination science was settled long ago, and is now laid to rest’. After all, that is what I was taught. But after my experience in the hospital system and thoroughly examining the medical literature, it became obvious that most medical professionals who parrot such statements have read almost nothing on vaccination and are just following orders. I know, because that was also formerly true of me. Doctors want to do what is right, but who creates their curriculum or continuing education modules? The medical curriculum is devoid of important information on vaccines. What is the real truth? What is not told to doctors and the public? The claim that ‘the science is settled’ is a factually, intellectually, and morally dishonest attempt to silence debate and discussion about the evidence and science in the medical literature, which speaks against the mainstream mantras. Hopefully, the paragraphs, videos, medical articles, and links that follow below will open some eyes and ears to information that is not taught in medical schools nor allowed in mainstream media. and heated up in the 1800s, when parents in the UK became fed up with watching their healthy infants and children become ill or die shortly after the smallpox vaccinations or get sick from smallpox despite being highly vaccinated. The smallpox vaccines were made from pus scraped off of diseased cows’ belly sores, contaminated with disease matter from a variety of animals and in some cases, humans. Parents and doctors who refused smallpox vaccines, risked losing their homes, their furniture and their livelihoods if judges ruled against them. I do not consider it my place to tell anyone whether to vaccinate or not. I never tell people to NOT vaccinate. It is my place as a doctor, to understand as much as I can about vaccines and to give people a more complete understanding from which to make INFORMED choices. Informed choice is not the stance of the public health services. There is ample documentation that their priority was and is to quell “any possible doubts, whether well founded or not” regarding vaccines. 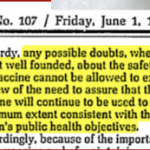 The following document is the American 1984 DHHS federal register, which listed final rules pertaining to the polio vaccination campaigns in USA after three decades of controversy. There are many problems with the science that underpins information given to both parents and doctors. I’ve yet to meet a pediatrician who understands both sides of the debate enough to give fully informed consent. Many doctors don’t even understand the vaccine inserts, or know what is in vaccines. Immunology literature admits that infant immunity has been misunderstood by immunologists in the past, and even today. Only recently have some important questions been answered about why infant immune systems don’t function like adult ones. Words like “deficient” or “immature” have been used to imply such ‘shortcomings’ of the infant immune system, and therefore infants must need numerous vaccines in order to survive. The immune system of a baby has the full capacity of an adult’s immune system. But a baby has a superimposed additional ‘program’ which temporarily curbs certain aspects of the adult immune system from working fully while the baby develops a healthy microbiome and learns which environmental proteins, antigens, and pathogens should be tolerated, and which ones should not. The core tenet of the superimposed program is to keep systemic inflammation to a minimum within a crucial transition period from in-utero to around two years of age, at the same time that human milk provides broad-spectrum disease protection. One example: human milk contains a molecule called H.A.M.L.E.T. and many other immune components that assist the baby’s immunity during its anti-inflammatory phase, while successfully protecting from capsular bacterial infections. Optimal sequential induction of immune tolerance requires the normal programming. Vaccines are in complete opposition to this programming. There are aspects of immunity that vaccines could never help with. For some infants, the interruption of the normal immune clamped process with aluminum and vaccines, has the potential to cause life-long serious consequences. HERE is my infant immunity series video to view for more information. There is a paucity of studies comparing never vaccinated children, with partially or fully vaccinated children. In 2017 two important articles were released regarding vaccinated and unvaccinated homeschooled children. The results should make any thoughtful scientist step back and ask exactly what vaccines are achieving. Please read both articles in full, Mawson 2017 pilot study, and Mawson 2017 preterm birth, vax, neuro disorders. In terms of safety studies, a major issue is that most vaccine studies use another vaccine or the background substance of the vaccine, as the control placebo. There is one study (Cowling 2012) where a true saline placebo was used, rather than another vaccine or the carrier fluid containing everything except the main antigen.That study showed no difference in seasonal influenza viral infection between groups but astonishingly it revealed a higher pandemic strain infection rate and a 5-6 times higher rate of non-influenza viral infections in the vaccinated. It is no small wonder that more true placebos are not used in vaccine research. In this article Steinhoff, Influenza vax preg we see a clear example of how false placebos are regularly used. Vaccinations themselves and the ever growing schedule, is a medical experiment, and in my opinion, violates the core principles of the Nuremberg Code (informed and unambiguous consent). Most vaccines have never undergone carcinogenicity testing for example, and likewise are rarely studied in pregnant women, which results in people taking vaccines, either by a proclaimed “emergency”; by a “public health” order from the WHO; or by threat of loss of rights over one’s children or of imprisonment; or by threat of being abandoned by the medical professionals supposedly providing care. This has also been extended to medical staff who lose their jobs if they refuse to take any mandated vaccine. Vaccines that are on the market, can also be unknowingly contaminated. Repeatedly over the decades, published medical articles, which threaten the vaccine industry are often attacked, and where possible discredited, or journals are forced to retract the articles. Therefore doctors never get to use them as part of informed consent. Drs Gatti and Montenari wrote an article on their research findings in 2017. The ARTICLE was systematically attacked from time it was printed. In February of 2018, Italians lost their rights to choose not to vaccinate their school age children. Shortly thereafter, Gatti and Montenari’s laboratory in Italy was raided, and all data and computers and personal devices in their homes was confiscated. HERE is a short article in English detailing what occurred. How can informed consent happen in this sort of environment? This isn’t the first time this has happened. My series, “Honesty vs Policy” describes historical examples. Dr Anthony Morris had similar trouble. This VIDEO tell some of his story, which is reflective of what vaccine whistleblowers from any era have had to endure. Parents must learn the ways to take care of their children when they get the common childhood illnesses, whether they vaccinate or not, since children can still get the diseases they were vaccinated against. In the case of unvaccinated children who experience childhood maladies, effective home-nursing allows children to recover naturally, and in most cases, the child will have long-term immunity. Infectious fevers must not be lowered as this does not help the child. HERE is a short video on the subject. Some vaccine policies have robbed teenagers and adults of the opportunity to have solid, multi-layered, long-lasting natural immunity. For example, in mothers who were vaccinated against measles, placental transfer of antibodies is limited to a few months instead of over a year in most naturally immune mothers. Reduced placental transfer of antibodies is but one of the many potential consequences we face as a result of mass vaccination for measles and the other childhood illnesses, such as rubella. Vaccine contents, dangers, effectiveness of, or necessity of vaccines is not taught in medical schools. Most medical doctors are fearful of the natural childhood illnesses because they have no idea how to safely assist patients through them. The limited mainstream treatment options I was taught, often resulted in the diseases becoming worse than they would have otherwise been. To my surprise, I later discovered other methods which work extremely well, but were never presented as part of my medical education. In a short article Tapping the immune system’s secret the limitations of immunology are plainly spelled out. The public is repeatedly misinformed, underinformed, or frightened in order to maintain their participation in vaccination. All sorts of tactics are used. One of the most popular, is to say that everyone should get vaccinated in order to protect the unvaccinated. This is commonly known as “herd immunity.” Here is a video series I made on herd immunity. Concerns about how much a young child’s immune system can handle at one time have prompted some parents to stagger vaccinations. But Fanburg points out that there is no medical data to support the practice, adding that it’s actually more beneficial to vaccinate infants, rather than wait until they are older. “Children have a better ‘take’ of vaccines in their first two years of life,” he says. “There is a higher rate of immunogenicity, which is the child’s ability to produce antibodies to the vaccine antigen. This ‘vaccine expert’ seems to lack understanding as to how an infant’s immune system develops and why. If he understood, he would pause for some time, before making such a dogmatic statement. It’s a well-established fact that three-year-olds require fewer vaccine doses to create the same level of antibodies as a baby. A baby’s immune system produces only very small amounts of IL-1B and TNF-alpha. There was a time when experts thought that this was simply a defect in all newborn humans. In 2004, a study by Chelvarajan suggested that if vaccine manufacturers added various immune system kickers into vaccines, this would solve the problem and fix these children’s immune systems. Subunit vaccines like HepB, Strep Pneumo, Hib and Meningococcal have potent “adjuvants” – such as aluminum. Without them, the baby’s immune system does not respond. An adjuvant creates a red-alert situation forcing the infant’s innate immune system to respond in the opposite manner to the way it should function in the first year of life. Pro-vaccine immunologists see nothing wrong with this. This anti-inflammatory phenotype may be beneficial to the neonate at a time when tissue growth and remodeling events are taking place at a rapid pace… thus the inability of the neonate to respond to infection with encapsulated bacteria may be the risk the organism takes for successful development. An ARTICLE by Elahi in 2013, showed that infant immune cells have full functional capacity, but are clamped down to allow the infant to learn what is self, what is a healthy commensal micro-organism, and what should later be attacked. This anti-inflammatory phenotype is crucial to the neonate at a time when tissue growth and remodeling events are taking place at a rapid pace… thus the possible inability of the neonate to respond to infection with encapsulated bacteria, (particularly formula fed infants) may be the risk the organism takes for successful development. Breast milk acts as a stand-in innate immune system, which protects the baby from toxin-mediated and other diseases, by supplying anti-inflammatory substances in the milk along with other immune particles which prevent bacteria and viruses from adhering, or kills them outright. This protects the baby, acting as in loco defense, while the infant immune system is being programmed to learn self from non-self. During this period of ‘clamping’ which is approximately 2 human years (extrapolated from animal studies), the breastfed infant is well compensated by the mother’s milk, which continues the educational process and kills unwanted organisms. This same pattern of development is seen in laboratories studying non-human mammals, and is ubiquitous across mammals, showing that the anti-inflammatory phenotype is crucial to successful survival both short and long term. What then, could be the effect of vaccines, which interfere with the quiescent state of the infant’s immune system master plan? Do the large amounts of aluminum create additional problems? With breastmilk support, an infant immune system develops appropriately and systematically – at a regulated pace, according to the genetic program which started from the day the child was conceived. What is the purpose of that master plan? To enable the infant to safely transition into immunological independence with the minimum level of inflammation possible. Can that master plan be derailed? Yes it can. What can derail the neonatal immune system master program? Anything which triggers an inflammatory response in the mother while she is pregnant or in the baby after it is born, such as the use of a vaccine. Ironically the medical research is very clear about one thing. It’s not the infection per se that causes the problem. It’s the activation of the immune system. How do they know it’s not just the infection? Because stress, toxins, and other non-infectious antigens can trigger the immune system cascade, in very similar ways to infection, with the same results. If it is important for successful development of a baby to allow the RISK of infection by NOT allowing two key parts of the primary infection defense to fire, what’s the OTHER risk you might take, if you force an immune system to do something it’s not supposed to do? A vaccine by definition, causes increased inflammation at repeated time intervals. Vaccines are designed to create peripheral and systemic inflammation. Vaccine adjuvants and antigens can cause brain inflammation, create allergies, and through molecular mimicry, provoke autoimmunity. So, you might now be thinking . . . if a baby’s default position is to NOT respond to toxin-mediated bacterial diseases, what chance does a baby have to survive in this world? That is what human milk was, and is for. Medical literature from the past and present shows the huge physical cost to babies of not giving them human milk, as well as the cost in both lives and money in developed countries. If you would like to learn more about neonatal immunity, read this 3-part blog series, and take note of the medical articles used. Provaccine doctors sometimes cite “peer reviewed literature” to supposedly prove their point, yet a closer look at their own literature often proves otherwise —as does a closer look at the sick population of the vaccinated children in their medical practices. Furthermore a careful study of medical text books over decades, reveals a very interesting trend. In the 1920s and 30s, doctors were often quite relaxed over diseases which today are presented as more deadly than the plague. Many grandparents today are completely bemused at the way the medical profession describes infections which were straightforward holidays from school for most children. This is not stating that there were never serious consequences. There sometimes were. However, today, most parents erroneously believe that every child will die from diseases which most grandparents found were nuisance value only. The medical system now considers measles more dangerous than plague or ebola, and the most dangerous disease known to man. Yet there is little need to be afraid of measles, because well-nourished children who get adequate vitamin A have an unremarkable course to recovery. Boredom might be their biggest complaint. Here is a relevant VIDEO SERIES discussing the corruption and misinformation in medical literature and media. I have discovered that whooping cough isn’t something to be scared of either. In the days when my only tool was an antibiotic, whooping cough occasionally caused me considerable concern, but not today. I’ve watched many parents all over the world treat whooping cough very simply by using high doses of vitamin C and occasionally homeopathy. They see slow steady improvement in the cough, and no serious complications. But you will not read about these cases in “peer reviewed literature” and your doctor doesn’t know about them, because the sick children those doctors treat are the only ones counted in the morbidity statistics. Healthy children who recover uneventfully because parents know what they are doing, are not seen by the medical system and therefore are not counted. The serious consequences from most childhood diseases come from just a few things; infant formula, cow’s milk, common medical drugs (especially antibiotics), malnutrition, and vaccines, as well and a lack of knowledge about simple methods of home nursing. All of these medical system barriers to recovery are completely avoidable. That is WHY when we take the time to look, we see so many never-vaccinated healthy children, nursed by intelligent parents who know what they are doing and why. First misconception: You are putting other people at risk by not vaccinating. At risk for what? Chicken pox? Ask your grandmother if she knew anyone who died from chicken pox or measles. Different diseases have different degrees of severity in different age groups. The misconception that “if you don’t vaccinate, you place others at risk” is based on an assumption that vaccinated people do not get the disease they were vaccinated for. Did you know that a controlled study published in BMJ in school age children showed that of all the whooping cough that was diagnosed, over 86% of the children were fully vaccinated and up to date for the whooping cough vaccine? There are similar studies showing that mumps and measles breakouts often affect the vaccinated. People who are vaccinated can have their immune systems altered in a manner that leads to susceptibility to other infectious diseases, and can also leave them vulnerable to the disease they were vaccinated for due to a phenomenon called “original antigenic sin”. What is “original antigenic sin”? This is where an injected vaccine antigen programs the body to react in a manner that is incomplete, and different to the natural response to infection . When the vaccinated contact that disease again, they are unable to mount an effective response to the pathogen because vital first steps are missing. The whooping cough vaccine is an example of this. A very noteworthy study was published in 2013, looking at baboons, which are susceptible and manifest whooping cough like humans do. In the study by Warfel, baboons that were either vaccinated or not vaccinated were later exposed to pertussis bacteria, something that cannot be done experimentally in humans (due to ethical considerations), but which yields very important data. As expected, the baboons that had never been infected got the cough and remained colonized with bacteria for a maximum of 38 days. But unexpectedly, baboons that were previously vaccinated and immunized vaccine-style, became colonized upon later exposure for a longer time than the naïve baboons; 42 days. However unvaccinated baboons that recovered naturally and were later exposed to the bacteria did not become colonized at all – zero days. Recuperated and vaccinated baboons were also exposed to pertussis bacteria and then placed in cages with naive baboons. Only the vaccinated baboons infected them. The naturally recovered baboons did not infect their naive cage mates. The following video contains relevant information that every parent should know. So, who is providing better herd immunity in the face of whooping cough bacterial exposure? Vaccinated individuals who presume they are immune, yet remain asymptomatically colonized for 42 days spreading bacteria? Unvaccinated kids who get infected and remain colonized for 38 days? Or the naturally convalesced who are not able to be colonized and therefore do not spread bacteria at all upon re-exposure? Better still: natural convalescence makes for solid immunity which lasts decades longer than vaccination. Many vaccine enthusiasts like to invoke the term “herd immunity” to make the argument that the non-vaccinated pose a risk to the vaccinated. But the concept of herd immunity has no relevance to the vaccinated as it was coined in reference to natural immunity in populations and what level the least epidemics occurred. There is no evidence whatsoever that having an 85% or 95% childhood vaccination rate necessarily protects from outbreaks. Second misconception: The non-vaccinated spread disease. Actually it is the opposite. Live vaccines are known to spread to close contacts. Here is one example.There has been a plethora of mumps outbreaks in mostly-vaccinated populations. The spin put on the data by the vaccine-religious is often downright amusing. One such amusement can be seen in this VIDEO of mine. We also know that in pertussis (whooping cough), those who are vaccinated are more likely, due to original antigenic sin, to be carriers of the bacteria longer than the non-vaccinated, even when asymptomatic. In his ARTICLE published in Clinical Infectious Disease in 2004, Dr. James Cherry pointed out that adults, re-vaccinated against pertussis, don’t develop any antibacterial activity whatsoever. He went on to explain why. The current vaccines contain a few antigens, which create “original antigenic sin”, whereby the immune response to the vaccine is abnormal. That first-learned response then becomes the default position the immune system takes, on future booster shots. So in the case of the whooping cough vaccines there are key protein virulence factors which have not been included in the vaccines including ACT, TCF, TCT, as well as BrkA and DNT. This is also explained in the video above. Because the first three are not included, the default immune response does not prevent colonization, and furthermore, Cherry stated that the “original antigenic sin” results in the vaccinated being unable to clear the bacteria from their lungs. The non-vaccinated have immunity to all the front line virulence factors and very quickly clear the bacteria on re-exposure. Mothers who have been vaccinated, may develop surrogate markers which can be measured in a laboratory, but these do not guarantee efficient immune responses after exposure to the natural disease, because their first “learned response” was incorrect. Furthermore, they are still not sure “what” the surrogate marker actually is for pertussis. There is similar information on measles, the other disease that has been portrayed by the media as a danger to the population due to non-vaccinated children. But this information is not accurate, nor is measles a dangerous disease in healthy people who have sufficient vitamin A. Damien et. al pointed out in this ARTICLE that the vaccinated are 5-8 times more susceptible to asymptomatic infection than the immune non-vaccinated. How then, are the non-vaccinated solely responsible for the recent outbreaks in measles? Many vaccines are said to be “attenuated” or modified-live and supposedly do not infect, but over the decades we have seen how those attenuated viruses mutate once they are in a human and can spread more virulent disease than what is being vaccinated for. The oral polio vaccines in Nigeria today is a case in point. But this can happen with any attenuated viral vaccine. The original Salk polio vaccines were supposed to be killed vaccines and yet they infected thousands of people, the household contacts and the community, killing and paralyzing over 200 people. The published figure is thought to be a gross underestimate of the true number of people affected. It is not uncommon to see a child recently vaccinated for chicken pox develop shingles or chicken pox. We see this often enough. I’ve also seen shingles vaccine (which has 14 times the amount of virus as the chickenpox vaccine) provoke shingles in an elderly woman days after the vaccine was given. And strangely enough, the doctors taking care of her had to go and research to see if shingles vaccines can cause shingles, because doctors know almost nothing about vaccines. Other questions to bear in mind is, “Were the people hospitalized because”: The disease was really serious:The family didn’t know how to deal with it:The family responded to a medical profession hard-wired to believe everyone with that disease can die? In other words, was the admission to the hospital really necessary? Influenza vaccines are continuously advertised as helpful even when the efficacy is very low. The science speaks against such helpfulness, but the science seems to be unread by those who make vaccine recommendations. Here is a VIDEO CLIP of my opinion of the influenza vaccine hype of 2017-18. Third misconception: Deaths from these terrible diseases that once plagued humanity will return to pre-vaccine levels, if we do not keep up the vaccines. 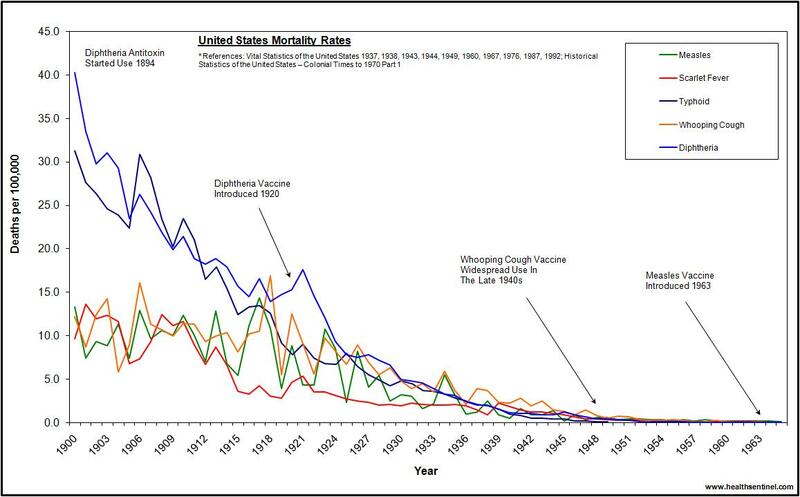 We can see from the graph at the end of this page, that the mortality from these diseases was drastically declining prior to vaccination. But in addition, you might want to know the more rational explanation for deadly disease decline in modern times. It’s not vaccination. It has been shown to be hygiene. In this article, “What is the causal link between hygiene and infections?” the authors offer the epidemiological evidence that vaccines played a minor role. Here is something else you may not have been informed of: All the reduction even for TB in USA, was achieved BEFORE any vaccines of any sort were offered, and most of the reductions for all diseases, were achieved before antibiotics became commercially available in about 1950 as well. So what did that? It wasn’t vaccines. Yet all the countries which used the BCG as front line “protection”, saw an identical decline to the one which we saw in USA using no TB vaccine. Mortality for several common illnesses had already declined significantly long before the vaccines were created. The downward trend of the curves is completely unaffected by vaccine introduction. If you compare graphs for death decline in diphtheria and scarlet fever, they are almost identical. Yet there never was a widely used vaccine for scarlet fever. Scarlet fever and its resulting complication, rheumatic fever —has clearly been shown in the medical literature, to be nutritionally driven. This is why if you do find someone who says they had scarlet fever, it is primarily in more impoverished, war-torn, hungry and poverty stricken countries. In developed countries where rheumatic fever is an issue, it’s primarily seen in the less educated groups, whose nutritional understanding is lacking, or their access to good food is limited. Yet under-educated people in stable social environments, without much money, who understand and follow effective nutritional pathways, will be on the scale of low susceptibility because nutrition and well being, is what really counts. Poor nutrition, is historically correlated with higher rheumatic fever and death. All of us carry Strep A regularly, but the well-fed amongst us don’t get scarlet fever, let alone its complication, rheumatic fever. This point is well studied enough to lay aside any concern over whether or not correlation implies causation. Historically, in the case of all infectious diseases, good nutrition has been and still is, a major preventive factor, that has led to enormous declines of morbidity and mortality from most infectious diseases. When I suggested to my chief of medicine in the hospital, that nutrition was an important factor in disease prevention, he outright scoffed at me. 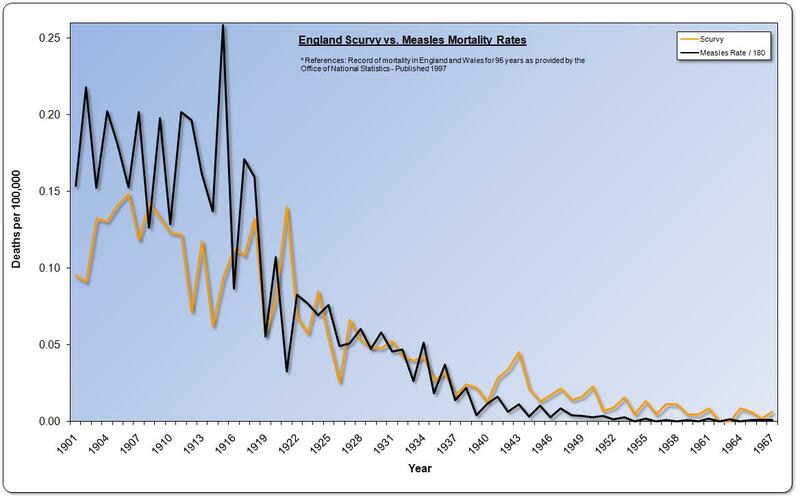 It is no coincidence that in the UK, scurvy and measles mortality were closely correlated, as seen in one of our graphs from Dissolving Illusions.